Gardens can be a wonderful place to relax and recharge. They can also be a great place for children to learn about plants and nature. One of the lovely things about the garden is it can be a lovely, safe space for nature. Bees, butterflies and hedgehogs are all decreasing in number, and all need a little help and a little more space. Here are a few ways to help your garden be more eco-friendly and encourage wildlife into your garden. Plant bee and butterfly friendly flowers. The Bumblebee Conservation Trust have a great guide for bumblebee friendly plants. And a test to see how bee friendly your garden is. 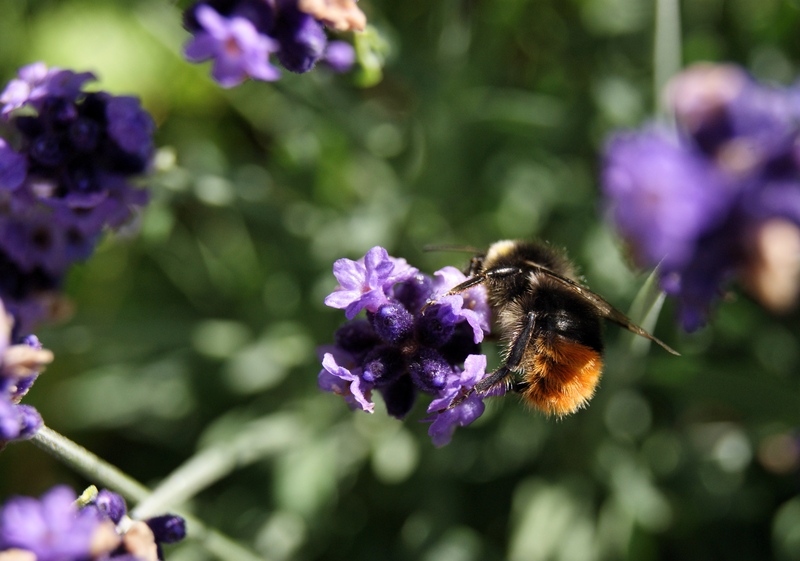 Some of our favourite bee and butterfly friendly flowers include lavender, geranium and crocus. Make gaps for hedgehogs in your hedges and fences (remember to check with your neighbours). Hedgehogs can walk up to two miles in one evening. Gaps in hedges and fences encourage the lovely creatures to wander and feed in gardens, rather than walking onto roads. For more information on Hedgehogs, please visit St Tiggy Winkles. Now Spring is here, birds, insects and mammals are all thinking of breeding. A great way to hep wildlife into your garden is to but up safe places for them to nest and raise their young. The RSPB have an aim this year to get 1000 swift nest boxes up across the UK. (Their numbers fell by about 50% in the 90s). These beautiful birds only land to nest. And any fledglings probably wont land for another two years after they leave the nest. They do wing press ups in the nest to prepare (one of my all time favourite wildlife facts). If you don’t have space for swift boxes, there are plenty of other permanent or moveable nest boxes you can make or buy. For insects, bees, birds or more. Chemicals can be an easy and quick way to kill weeds and pest, but they can also have a negative and long lasting effect on wildlife. There are some great ways to control pests without chemicals. Including nematodes and planting plants like citronella near the plants you want to protect, to put off pests. Ducks are also a great way of keeping snails and slugs down, but they aren’t very discerning and will also eat worms, bees and the odd plant if given the chance. If you are lucky enough to get birds and mammals in your garden, leaving a little extra food and water out for them will help ensure the stay. Make sure any water is in shallow dishes so they are safe for the animals. And never leave out milk. Bird food, fat balls and some fruit can be used to encouraged birds. Our recycled bird feeders are great for adding scrapes, apples or fat balls. But please check the scraps you are putting out are suitable for wildlife. Many creatures can be encouraged into spaces that are left to themselves. Whether that means leaving a wildflower area, or not tidying up all your leaves. Leaf mulch can encourage insects, which then encourages larger animals, encouraging a lovely mini eco-system into your garden. Different bees nest in different ways. Most people would recognise the honey bee hive. But not all bees have such grand homes.